For the more adventurous, we have created this exotic blend of South American cocoa and spicy red chilli’s to warm you up. Fräus “Seriously Rich”TM range of chocolate products are a result of blending the most precious and aromatic cacao, with a variety of natural products to create a drinking chocolate regarded amongst the worlds finest! 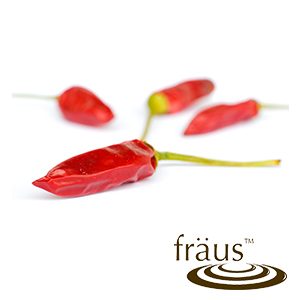 The range of Fräus flavours dates back to the old tradition of chocolate making by the European masters. By blending the precious “Caraque”, regarded as the most aromatic and rare of Cocoa available, they were able to produce noble recipes exclusive to the royalty of Europe and eventually introduced into the circles of high society. It is now our pleasure to bring to you Fräus’ unique range of the finest blends of drinking chocolate, obtained after years of experience in the “Chocolat” production. Enjoy more than 10 different flavours of rich drinking chocolate!